Amorolfine 5% Nail Lacquer is a treatment to help treat fungal nail infections and is available to buy from The Independent Pharmacy following a free online consultation. Amorolfine is the generic prescription equivalent to Loceryl (Curanail) 5% Fungal Nail Treatment 3ml and sold online in a 5ml pack (with a free private prescription) - saving you money on your fungal nail treatment. Amorolfine 5% Nail Lacquer is available to buy from The Independent Pharmacy Online Doctor service, following a free consultation, to help treat fungal nail infections. To find out more about fungal nail infections and see all the available treatments, see our Online Doctor Fungal Nail Infection page. What is Amorolfine Nail Lacquer? Amorolfine nail recovery paint is a generic version of the common over-the-counter fungal nail treatments, Curanail and Loceryl gel. 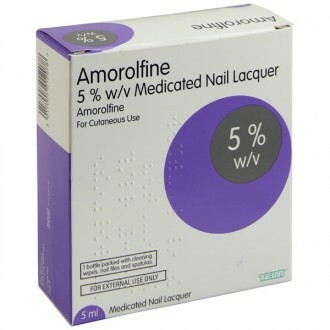 Amorolfine 5% Nail Lacquer contains amorolfine, an antifungal medicine. Amorolfine works by stopping the production of a chemical called ergosterol in fungus that causes nail infections. Without ergosterol, the fungus stops growing and its cells breakdown. It will be removed as the infected nail grows out until only healthy nail is left. Amorolfine nail polish is available to buy in a 5ml pack size as the generic prescription equivalent to Curanail 5% Fungal Nail Solution 3ml. 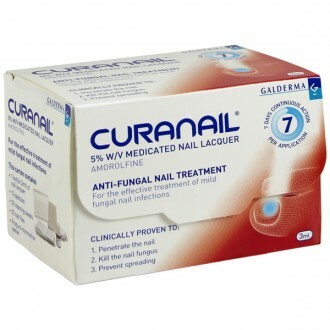 Curanail over-the-counter treatment is only suitable to treat up to two infected nails whereas Amorolfine 5% Nail Lacquer can be prescribed by the Online Doctor to economically treat multiple nail infections at a time. For more information about this treatment what it is and how it works, visit our about Amorolfine page. How do you use nail lacquer? Treatment with amorolfine hydrochloride nail lacquer should continue in accordance with the instructions until the infected nail has completely grown out and recovered. Depending on the speed of nail growth, this is usually around 6 months for a fingernail and 9-12 months for a toenail. You should start to see an improvement in your nails before this time as healthy nail starts to grow out. As a rough guide, you will need around 1ml of Amorolfine 5% Nail Lacquer per nail for 3 months’ treatment. This will vary slightly depending on the amount you apply and the size of your nails. If you do not see improvement in your fungal nail infection after 3 months of treatment with amorolfine hydrochloride, you should see your GP. According to the instructions, Amorolfine 5% Nail Solution should be applied to each infected nail once weekly. It is important to use the treatment regularly to ensure it is effective. You should apply the treatment to all of the infected nails on the same day each week, preferably at the same to time to make it easier to remember. This may be after a bath, shower or regular activity. Fungal nail infections are caused by the same fungus that causes athlete’s foot. If you are also suffering from athlete’s foot, it is important that you also treat this to prevent your toenail from becoming re-infected after completing a course of Amorolfine nail treatment. See our athlete’s foot section for a range of antifungal creams, medicated gels, sprays and powders. You can also use antifungal powders in your shoes and socks if you are suffering from a fungal nail infection to help keep them free of fungus and stop the spread. If you suffer from diabetes, a weak immune system, or poor circulation, you should see your GP for treatment of your fungal nail infections. This is because you need your infection monitored more closely to ensure there are no complications. Using a new file, gently file down the infected areas of nail, including the nail surface. Protect any healthy nails while you are doing this so that you don't spread the infection. CAUTION: Do not use the same nail file for infected nails and healthy nails, as this could spread the infection as well. To prevent the spread of infection take care that no one else uses the files from your kit. Use one of the swabs provided, to clean the nail surface. Do not throw the swab away as you will need it later to clean the applicator. Dip one of the re-usable applicators into the bottle of Amorolfine nail lacquer. The lacquer must not be wiped off on the edge of the bottle before it is applied. Apply the lacquer. Apply the nail lacquer evenly over the entire surface of the nail. Allow to dry. Let the treated nail(s) dry for approximately 3 minutes. You can use the applicators provided more than once. However, it is important to clean them thoroughly each time so that you don't spread the infection. Use the same swab you used for cleaning your nails. Don't touch the newly treated nails with the swab. Close the Amorolfine nail lacquer bottle tightly. Dispose of the swab carefully as it is flammable. Before using the Amorolfine nail lacquer again, first remove the old lacquer from your nails using a swab, then file down the nails again if necessary. When dry the nail lacquer is unaffected by soap and water, so you can wash your hands and feet as normal. If you need to use chemicals such as paint thinners or white spirit, rubber or other impermeable (waterproof) gloves should be worn to protect the lacquer on your fingernails. It is important to carry on using the Amorolfine nail lacquer until the infection has cleared and healthy nails have grown back. This usually takes 6 months for fingernails and 9 to 12 months for toenails. You will see a healthy nail growing as the diseased nail grows out. It is important that you continue the treatment without interruption until the infected section of the nail has completely grown out, otherwise, the infection will just come back. The hardest part may be remembering to apply Amorolfine 5% Nail Lacquer each week. It will help to apply Amorolfine on the same day each week and write the date of use on a diary card or on the box, to help to keep a running check of when you used to the medicine. In general, Curanail can take six months of treatment to clear up a fingernail infection and nine to twelve months for toenail infections. After applying Amorolfine 5% w/v Medicated Nail Lacquer, an interval of at least 10 minutes should be left before application of any cosmetic nail lacquer or paint. You should ensure that the cosmetic nail polish is fully removed before your next application of antifungal treatment. However, the use of nail varnish or artificial nails should be avoided during treatment. Burning sensation in the area where you're using it. For more information about the possible side effects of Amorolfine, visit our about Amorolfine page. Amorolfine 5% (50mg amorolfine per 1mL nail lacquer). Ethanol anhydrous, Ammonio Methacrylate Copolymer (type A), Ethyl acetate, Butyl acetate and Triacetin. Do not use Amorolfine if you are pregnant or breastfeeding, for children aged under 18 years, a destroyed or very damaged nail. If you suffer from diabetes, poor blood circulation in your hands or feet, or an underactive immune system, for example, due to diseases such as HIV or treatment with medicines such as chemotherapy, immunosuppressants or high-dose corticosteroids, please see your doctor. If there is no improvement after three months treatment you will need to see your doctor. Avoid contact with eyes, ears and mucous membranes (e.g. the inside of the nose and mouth). The disposable nail files provided with Amorolfine 5% Nail Lacquer should be discarded after use. Use a new file for each weekly treatment. Do not use the nail files used for infected nails to file healthy nails, as this may spread the infection. You should not use nail varnish or artificial nails on the nails you are treating with Amorolfine 5% Nail Treatment. If you need to work with organic solvents (e.g. thinners, white spirit etc.) during treatment with this medicine, you should wear waterproof gloves to protect the medicine on the nails. Need to know more about Fungal Nail Infections? Amorolfine nail lacquer is a topical application used to treat fungal nail infections (onychomycosis). The solution works by killing the fungi that cause fungal nail infection. Amorolfine can be applied to both finger and toenails. Yes – Amorolfine medicated nail paint treats fungal nail infections like onychomycosis by stopping the growth of the fungi responsible for the infection allowing the infection to grow out with the nail. It can be applied to both finger and toenails. How often do I apply Amorolfine nail varnish? Amorolfine should be applied directly to the infected nail(s) once or twice a week, or as otherwise directed by your doctor. Where do I apply Amorolfine nail varnish? The solution can be applied anywhere on an infected nail, so long as the infection has not spread to the lunula, which is the white area at the base of the nail. How long does one bottle of Amorolfine last? One 5ml bottle contains enough solution for 150 applications. Because amorolfine only needs to be applied 1-2 times a week, one 5ml bottle should last the full duration of treatment. This is assuming you are treating 1-2 nails for up to 12 months. How long should I use Amorolfine nail lacquer? Treatment should be continued until the affected nail(s) are completely free of infection. On average, fingers nails require up to 6 months of treatment, whilst toenails can take between 9 and 12 months. Try not to be discouraged during the initial stages of treatment if there are no signs of visible improvement. Healthy nails only grow about 2mm every month so it can take for results to show through. Are the nail files, applicators, and swabs reusable? The nail files and alcohol swabs should be discarded after each use. However, the applicators can be reused, providing they have been wiped with the alcohol swab prior to use. If I am pregnant or breastfeeding, can I still use Amorolfine nail paint? Sadly, there is no data regarding the use of amorolfine during pregnancy. Also, there is no information on whether amorolfine passes into human breast milk. For these reasons, amorolfine should not be used during pregnancy or breastfeeding. For further advice please consult your doctor. Why is Amorolfine nail lacquer sometimes more expensive than other fungal nail products? Amorolfine is a clinically proven fungal nail treatment. Because the solution is only applied 1-2 times a week, one 5ml bottle can potentially last for up to 12 months. Most cheaper alternatives are designed for daily use, which means you will need to buy multiple bottles to cover the same length of treatment. As a result, you end up spending more. How do I diagnose a fungal nail infection? A fungal nail infection occurs when fungus infects the nail bed. This causes several noticeable symptoms that make the condition easy to identify. Firstly, the nail can become discoloured, turning yellow or brown. Secondly, the texture of the nail can change, making it thick and brittle. In some cases, the nail can also separate from the nail bed. What are the side effects of Amorolfine nail lacquer? Generally there are not many side effects associated with using Amorolfine nail polish. One side effect can be a burning sensation around the skin where the varnish has been applied. If you experience any other unusual side effects, contact a doctor or pharmacist.